and up. Some Util. Inc. 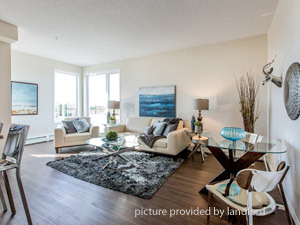 BRAND NEW STUNNING SUITES IN ST. ALBERT WITH GREAT INCENTIVES! EARLY MOVE-IN...PLUS ONE MONTH FREE RENT!! COME VIEW OUR GORGEOUS SHOWSUITE! Luxury meets style at Giroux Estates. The sleek and contemporary suites in Ville Giroux are like no other in St. Albert. Designed with you in mind, each of the open-concept suites includes four stainless steel appliances and in-suite laundry. Luxury vinyl plank flooring and granite countertops offer the ultimate in style and performance. Choose from a bachelor, 1 bedroom, 1 plus den, 2 bedroom and 3 bedroom suites with 9 foot ceilings and condo quality finishes that are sure to impress you. Giroux Estates is home to a great range of amenities including a fitness room, social room and bike storage. Enjoy the benefits of underground parking, an elevator, a secure building with key fob entry and 24 hour professional on-site management. A new level of living is waiting for you at Giroux Estates, make your home with us and love where you live. Click here to Book Appintment! *Prices, incentives, availability and specifications are subject to change. Images may not reflect actual suite finishes. Pet restrictions may apply. E. & O.E. Visit http://www.realstar.ca/apartments/ab/st.-albert/giroux-estates/index.aspx for more details.